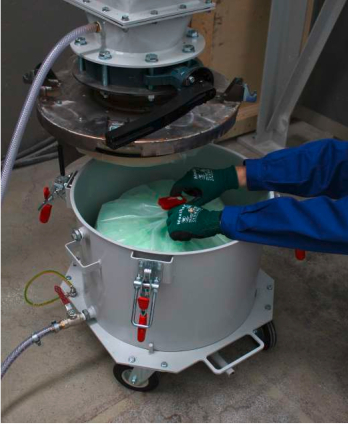 During the processing of potentially harmful substances - for example, in the pharmaceutical industry, proper containment solutions are required to protect personnel. Powerful extraction systems filter these substances from the air. During the waste disposal of particulate, however, cost-efficient solutions that are adaptable for smaller filtration systems have so far been unavailable. Keller Lufttechnik has recently designed a Bag-in-Bag system for dry filtration units that is scheduled to be released to the market in the beginning of 2019. In the pharmaceutical industry, the requirements for safe manufacturing processes have been tightened. The substances people are exposed to are becoming increasingly more potent. To minimize potental risks, secure containment solutions are in demand. Containment includes the unit housing as well as the material processed inside, so that personnel experience minimal exposure. The potential risk of a substance is defined by what is known as the OEB value. OEB stands for "Occupational Exposure Band" which means the occupational safety classification. Currently there are 6 OEB classifications. The higher the count, the stricter the requirements. Currently, an OEB 4 and OEB 5 are often required. For OEB 4, an "Occupational Exposure Limit" (EL) of 1 -​<10 µ per m³ air is in effect. OEL defines the allowable volume of a substance contained in 1 m³ of inhaled air so that a person can breathe it safely for 8 hours. OEB 5 allows only less than 1 µ of a substance in 1 m³ air. This is the equivalent of 1/20 of a teaspoon of the substance contained in the air volume of the Empire State Building. "Our extraction systems are capable of filtering machine exhaust air so well that they meet the strict emission limit values", says Leopold Rang, Product Manager at Keller Lufttechnik. "There is an additional challenge: During dust disposal, personnel may be exposed to too high concentrations of harmful substances." This is why extraction systems capture this particulate that often gets released during dedusting by means of endless hoses. When a bag is full, it is double sealed on top and cut off between the two seals. 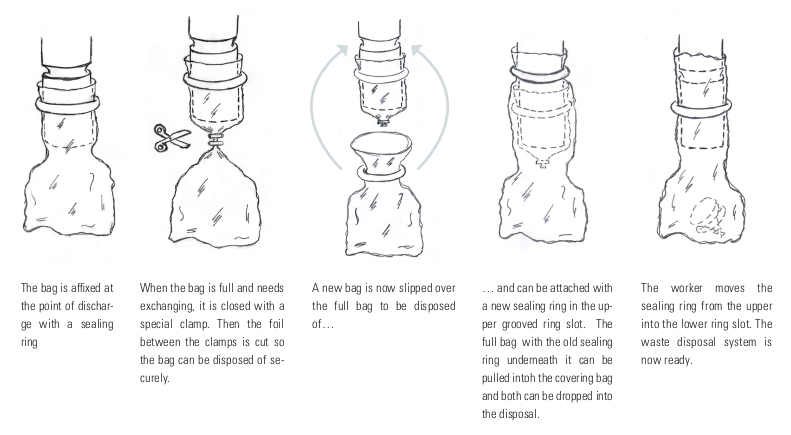 The lower part is disposed of, while the upper section is pulled down for a new bag to collect the filtered particles. "The disadvantage of this process is that the design is very complicated and expensive", Leopold Rang explains. For larger extraction plants with air flows of 10000 up to 15000 m³/h the investment cost is potentially proportionate to the cost of the entire system. This is not the case, however, for smaller systems. "We noticed a trend towards compact filtration systems as many manufacturers demand more production flexibility", says Rang. "For such systems with air flows of 1500 up to 2000 m³/h, we need new containment strategies for the waste disposal process." The solution Keller Lufttechnik's engineers came up with is called a Bag-in-Bag system. A full disposal bag is doublesealed and then cut off between the two seals. The upper part of the bag remains, sealed at the bottom, hanging at the extraction system. Then a clean bag is positioned over it and attached over the residue of the full bag. The residue of the full bag is pulled down into the clean bag and is disposed of in the next waste disposal, a simple and cost-effective solution. "This new system will be available on the market in the beginning of 2019", Leopold Rang announces. With this secure waste disposal system, Keller Lufttechnik is planning to expand into markets beyond the chemical and pharmaceutical industries. The safety requirements are increasing in other industry segments, as well: Quartz dust in the ceramics industry and concrete production today is classified as being a carcinogen. Therefore, new occupational limit values are applicable. Another example is the processing of carbon fiber reinforced plastics which release fine conductive fibers that could create electrical short circuits inside control units. In these instances the use of the new containment solutions is also beneficial.